In this showcase, you will be able to get inspired by the creativity from other web designers. TopUp able to display various contents while maintaining your HTML code 100% clean. 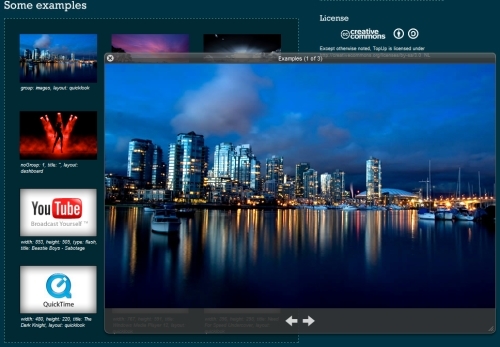 For example, it can display web pages, images, Flash, Yuotube, QuickTime, iframes and DOM elements. TopUp is compressed with Yahoo! YUI Compressor so that it is small in size and load faster. Thematic maps are very useful when describing statistical data about places. The data, simply, becomes much easier to understand. The areas on maps are mentioned as latitudes or regions (depending on the type) which means no hacking or manual calculations. Best Collection of Free Jquery form Elements. To present a better user experience, we often need to take good care of the little details like the functionality and interactivity of tables, forms, images or other media resources; excellent navigation and security is also a must. So today i am prsenting Best collection of Jquery form elements. Ajax Fancy Captcha is a jQuery plugin that helps you protect your web pages from bots and spammers. 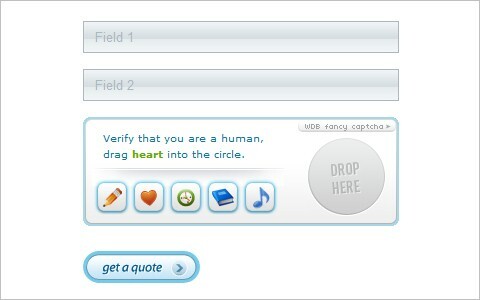 We are introducing you to a new, intuitive way of completing “verify humanity” tasks. In order to do that you are asked to drag and drop a specified item into a circle. Captcha’s security level is only medium, with the emphasis on nice looking and user-friendly qualities that still offer reasonable protection from unwanted “guests”. The basic design and elements are easy to change and customize; take a look at the file structure for more information. Brute force, if your site it attacked, this hacking method can be the very devil. This plugin shows the strength of your passwords by telling you how long it would take to brute force them. I was inspired by some work I saw over at filamentgroup.com but their was more of a proof of concept than production code. I decided to try and make the code ready for production and hopefully it will be a little easier to use. I also packaged everything up into a nice download so even a novice can enjoy these fantastic improvements to the standard Date Picker. Hello dears, it’s time for comprehensive programming article. Here you’ll find Hot and best jquery and CSS based drop-down or just multi level menu tutorials with down loadable files and explanations as well.